Beat the butter in a large bowl until pale. Sift in the icing sugar and cocoa and beat until smooth. In a food processor, blitz the Madeira cake to fine crumbs and tip into the butter mixture. Finely grate the orange zest in and mix until thoroughly combined. Divide the mixture into four even portions. Taking one Creme Egg, shape one portion of cake mixture around it to enclose in an egg shape. Repeat to make four Scotch eggs, arranging on a tray lined with non stick baking paper as you go. Crumble the Flake into small pieces on a plate. 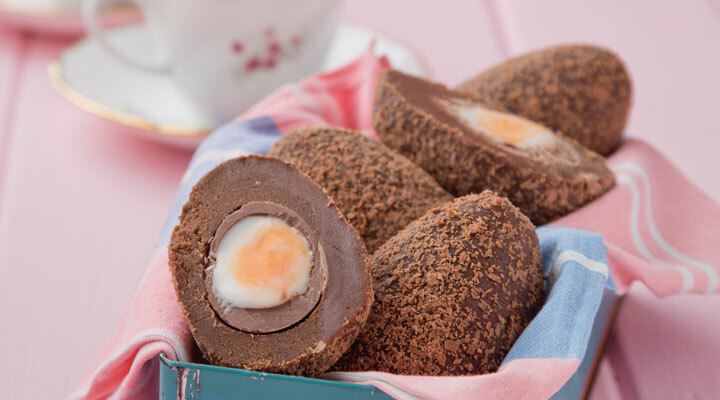 Roll each egg in the Flake to stick and coat evenly. Refrigerate for at least 30 minutes, until set firm.These will keep for up to a week layered between parchment paper in an airtight container in the fridge. Top Tip: Instead of crumbled chocolate on the outside, coat the eggs in chopped nuts or toasted desiccated coconut.